I Often have a tough time convincing visitors that anything authentic exists in Orlando. And when it comes to authentic Irish pubs, I sometimes have a hard time convincing locals. But take it from a professional boozehound who has had his share of pints both here and in Ireland: Central Florida is home to some quality Celtic bars. Statistically, this shouldn’t be surprising. 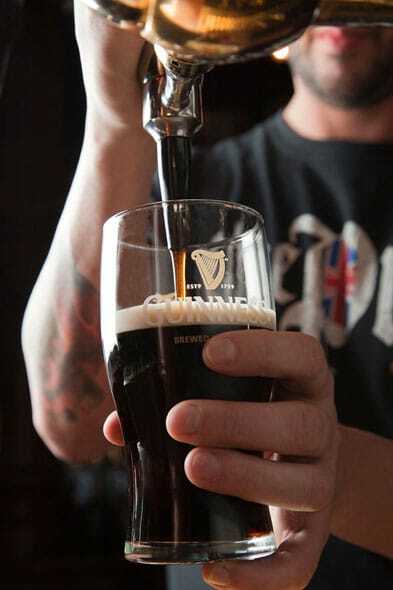 According to 2010 U.S. Census data, Orlando has the sixth-highest population of residents with Irish ancestry in Florida, and the flow of tourists from the United Kingdom creates a steady demand for a well-poured Guinness. This month, that demand will be fairly universal. Here are six of my favorite spots for revelers hoping to escape the weekend warriors this St. Patrick’s Day (March 17). Stickler’s note: This list excludes British pubs, but if you’re more into raising pints than splitting hairs, you can’t go wrong at Bull & Bush (2408 E. Robinson St., Orlando) or St. Andrew’s Tavern (1119 West State Road 436, Altamonte Springs). An Tobar: One of Central Florida’s best Irish pubs, this roomy refuge is also one of the top hotel bars in the greater Orlando area. With a bar and wood accents constructed in Ireland, An Tobar’s warm interior lay dormant for years after Sheraton Hotels bought the original Hotel Orlando North in 2005. The pub reopened last year just in time for St. Patrick’s Day, and if you missed it then, don’t make the same mistake this time. This year’s St. Patty’s bash on Tuesday, March 17 boasts an impressive lineup of live music acts including the bagpipes and drums of Cu Dubh at 5 and 10 p.m. and the headlining U2 tribute band UV at 7:30 p.m. Admission is free. Fiddler’s Green Irish Pub & Eatery: Situated a Blarney stone’s throw from downtown Winter Park, this neighborhood staple is a reliable antidote to Park Avenue gloss. With terrific fish and chips and the strategic layout of a true Irish pub, visitors can join singalongs with traditional Irish music acts in the main room or hide out with Rollins College regulars in one of “Fid’s” conspiratorial nooks. The Harp & Celt: In a crowded field of downtown Orlando bars, The Harp & Celt stands out as the greenest. When President Barack Obama had his requisite beer with the masses during a 2011 stop, it was poured at The Celt. The dining area, The Harp, serves up tasty and filling Irish fare, and both are perfect for a St. Pat’s party. The Lucky Leprechaun: Both the name and the locale scream “tourist trap,” but if this is a trap, lock me up and throw away the key. Drop by during any English football match and you’ll find a dedicated crowd, and the bartenders here hit that sweet spot between friendly and no-nonsense. Raglan Road Irish Pub: Sure, it’s in Downtown Disney, but this expansive pub works mighty hard to cut through the tourist clamor. St. Patrick’s weekend is always a blowout, with Celtic bands such as Scythian and Reel Ó Grande playing on indoor and outdoor stages from March 13-17 while the Raglan Road Dancers tap along.